Who knew hormones could be causing those hot flashes and excess weight! Want to get your hot flashes, night sweats and weight under control? If the answer is yes, come to tomorrow’s FREE Stress Hormones & Health dinner presentation (includes free meal & informational health presentation)! You will learn how your hormones are causing all of the above symptoms and, most importantly, how to correct them. RSVP because space is limited. 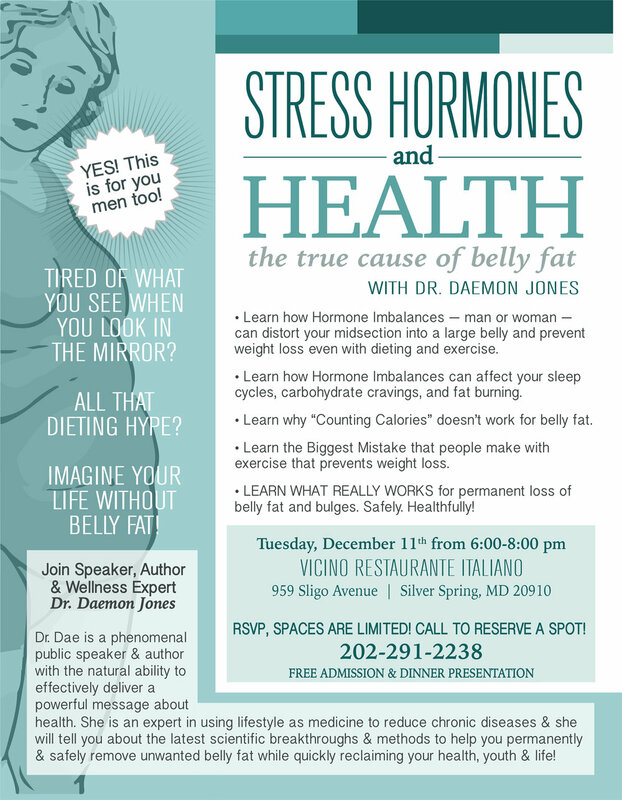 The FREE dinner presentation will be held Tuesday December 11th at Vicino Restaurante Italiano, 959 Sligo Ave, Silver Spring, MD 20910 at 6:00pm, sharp. Space is limited so RSVP by calling 202-291-2238. Free public parking is available behind the restaurant.